Outside Great St Mary’s Church, over 200 Cambridge students, staff, and residents gathered yesterday evening to mourn the victims of the Christchurch terror attack and to stand in solidarity with Muslim communities in its wake. 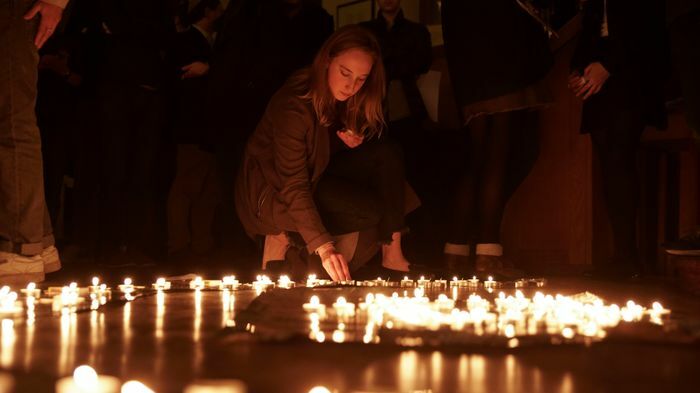 The vigil, organised by Cambridge UCU and Great St Mary’s Church and co-hosted with a number of student activist groups, was held in honour of the lives of the 50 people killed when a gunman opened fire at two mosques in Christchurch, New Zealand, on Friday. During the hour-long event, those present lit candles and listened to speeches, prayers, and poems spoken by representatives of a variety of Cambridge faith communities and audience members. After several opening speeches, a co-archbishop of Aotearoa, New Zealand and Polynesia, Winston Halapua, led the audience in a minute of silence for the victims of the attack. Halapua spoke on his own surprise at finding that, with the news of the Christchurch attack, “violence now has reached the midst of the Pacific Ocean”. He introduced the minute of silence as “a silence of eternity” for the victims. The first speaker at the vigil, Cambridge UCU secretary Waseem Yaqoob, thanked those present for “braving the cold and coming together to grieve” for an event which left him, along many others, “heartbroken and devastated”. His remarks, as well as many of the speeches which followed from members of the crowd, also raised that the attack took place in a climate often hostile to Muslims and immigrants, “that allows Islamophobia and white supremacy to thrive”. Cambridge PhD student Nabila Idris, speaking on behalf of the Cambridge Islamic Society, described the terror attacks at a Pittsburgh synagogue in October 2018 and a Quebec City mosque in January 2017 as part of “this ever-increasing list [for which] it is not enough just to mourn” for those killed. Calling for a pushback against Islamophobia, xenophobia, and racism, Idris said: “[Islamophobic] fears are stoked by sections of the media, parts of the intelligentsia, and dirty politics” and that, for Muslims, “our skin colour, our religion are seen as threats”. “We can actively choose to foreground the humanity we share”, she added. Several speakers from the gathered crowd emphasised the importance of speaking out “against the voice that seeks to divide”, and that people take “concrete steps” against Islamophobic sentiment. One speaker described the distinct experiences of Muslims for whom “the scars will remain”, calling for non-Muslims to “do more than sympathise [or] come out to a vigil”. The vigil concluded with members of the audience singing the first verse of the song Hallelujah. Among the youngest known victims of the Christchurch shooting are three-year-old Mucad Ibrahim, who was separated from his father and brothers at the Al-Noor mosque, and four-year-old Adbullahi Dirie, the son of Somali refugees. According to the New Zealand Herald, three other known victims were boys under the age of 18, including Hamza Mustafa, aged 16, who died alongside his father Khaled Mustafa, having fled Syria a few months earlier. Another victim of the attack is known to be 71-year-old Daoud Nabi, a refugee from Afghanistan who died while trying to shield another worshipper during the attack.